Florence is the kind of city that despite its small size, can collect hidden spots that even seasoned locals might never know about. 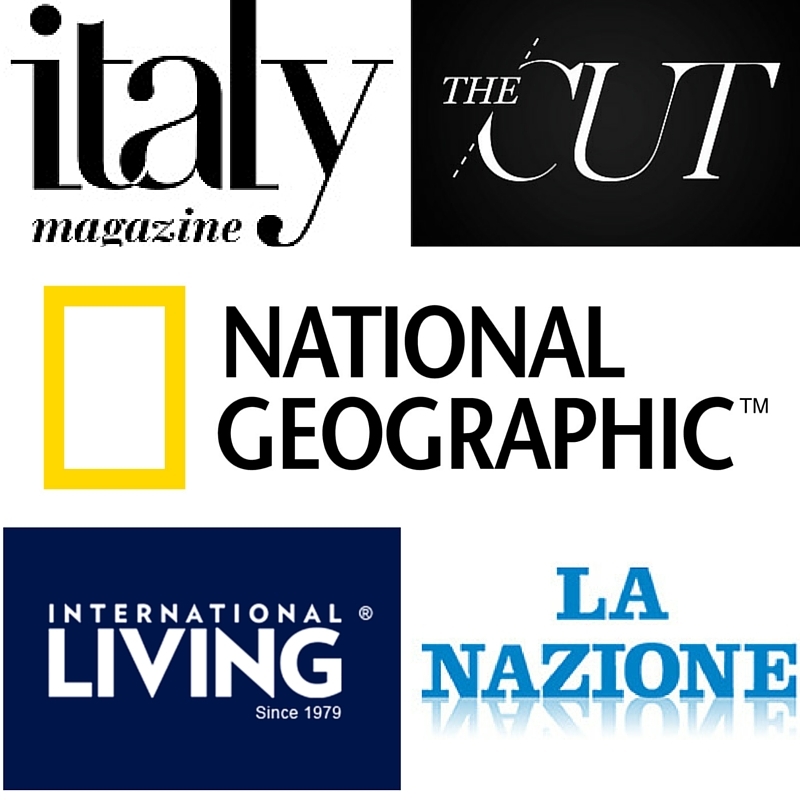 I imagine that the reason being that Italians as a culture are less apt to share these secret places that they love. Hence why they remain somewhat mysterious and hard to find. Which if I’m honest, is a little more exciting at times. Another reason is that many small businesses just don’t invest in marketing themselves online because they don’t want to or don’t know how. 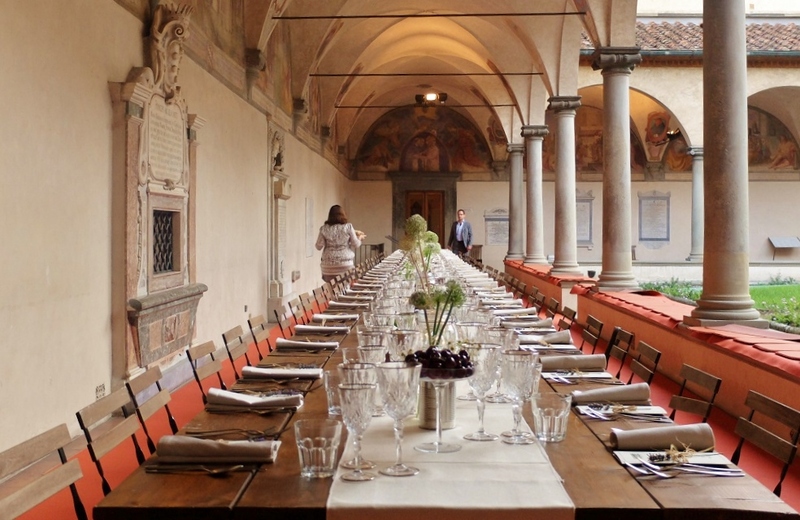 Preferring the ‘word of mouth’ approach that has made Italian goods so famous in the past. It can seem ‘strange’ to some of my Americana friends but as I live here longer, I sort of get it even if I do wonder how some places can financially stay in business. 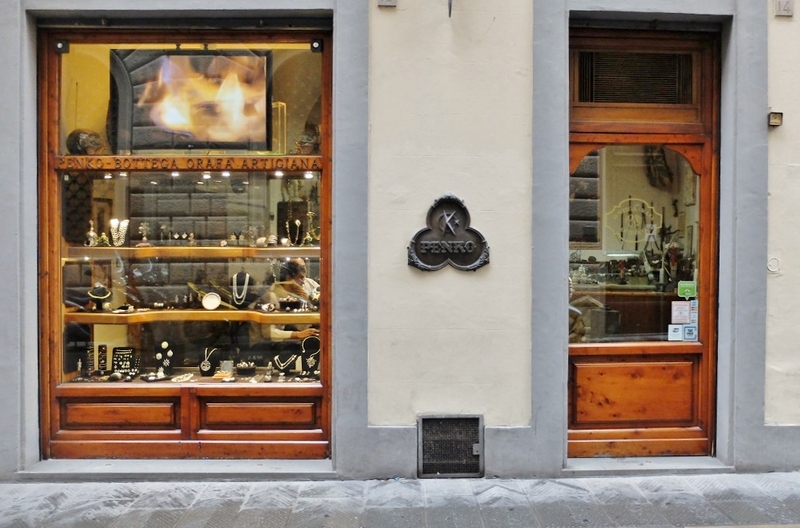 While there are many shops that are very special, all around Florence, I want to focus on neighborhoods. Of course this means I need to start with ‘home’, the area I can’t shut up about, my previous oltrarno ‘other side of the river’ or ‘Rive Gauche’. 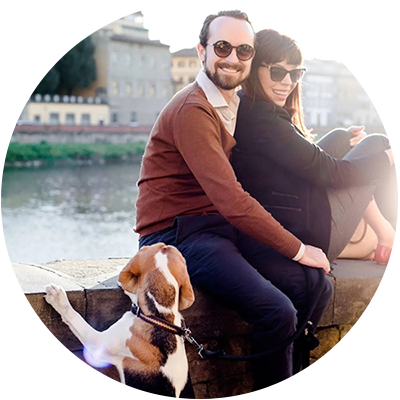 After talking with my friends over at Palazzo Belfiore, which by the way has some truly amazing apartment vacation rentals just steps from my favorite piazza della passera, I knew I needed to write this post. While I don’t dare say anything here is a ‘hidden find’ – let’s get real here, almost everything has been ‘found’. These spots are places that are special to me that I think people would enjoy knowing about. 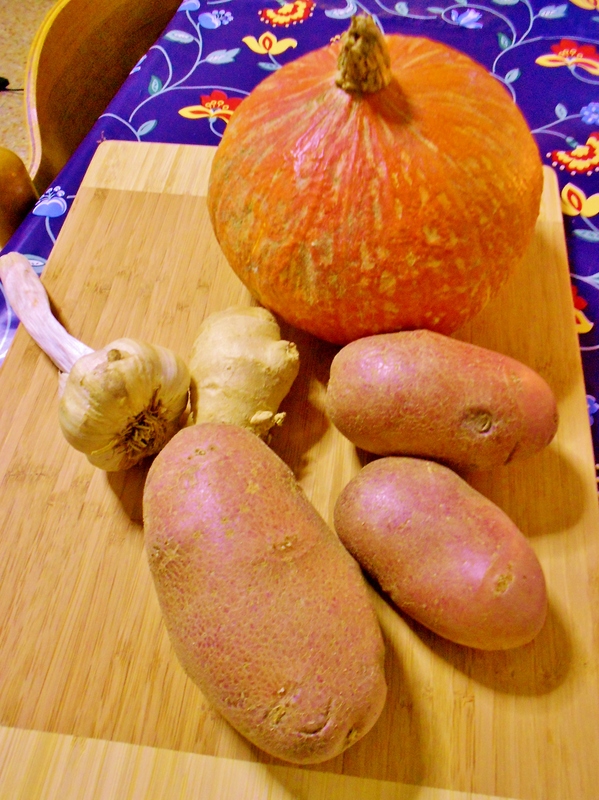 They also happen to be pretty budget-friendly with a few exceptions. One thing to keep in mind is that this area keeps to the Italian tradition of closing for lunch (from around 1 to about 3 or 4pm) and stores are often closed on Mondays. I also recommend checking out my post about the artisan craftsman that make this area of the city famous and which are one of the many reasons I wanted to live in this neighborhood. Location: via romana 22r. 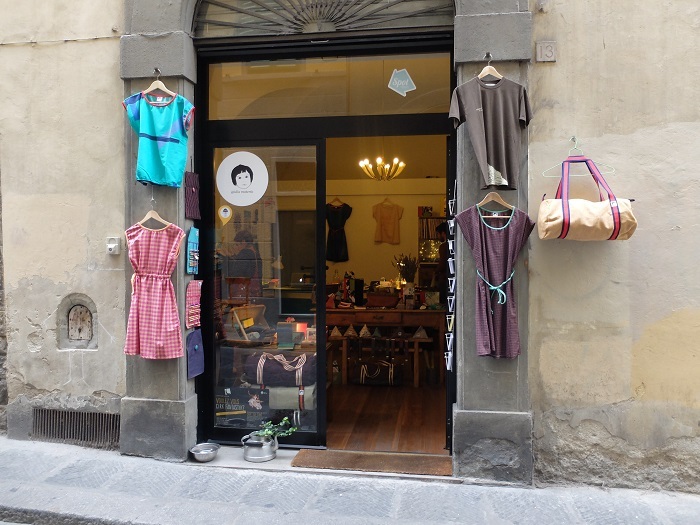 This store that sells clothing for women, all in a variety of interesting shapes and textures and happens to be one of my favorite little hops in Florence. The quality is good and the prices are very reasonable, it almost reminds me of the style of Dixie (a major brand in Italy). The kind of place where you can get a long tunic or wool sweater, they also carry a range of interesting accessories – I adore their necklaces. Location: via romana 39r. Another ‘made in Italy’ spot that is a wonderful place to shop for gifts, the owners Anita and Chiara are super friendly and will explain any item and offer you tea, what more can you want? I love my hedgehog table piece made out of an old journal and glass blown products that we often pick up for friends or relatives. They also sell fun handmade hats, that they can fit to your head and pretty jewelry, often made of blown glass. Location: via romana 18/r. I am often in this shop picking up cards for friends, birthdays, any moment really. 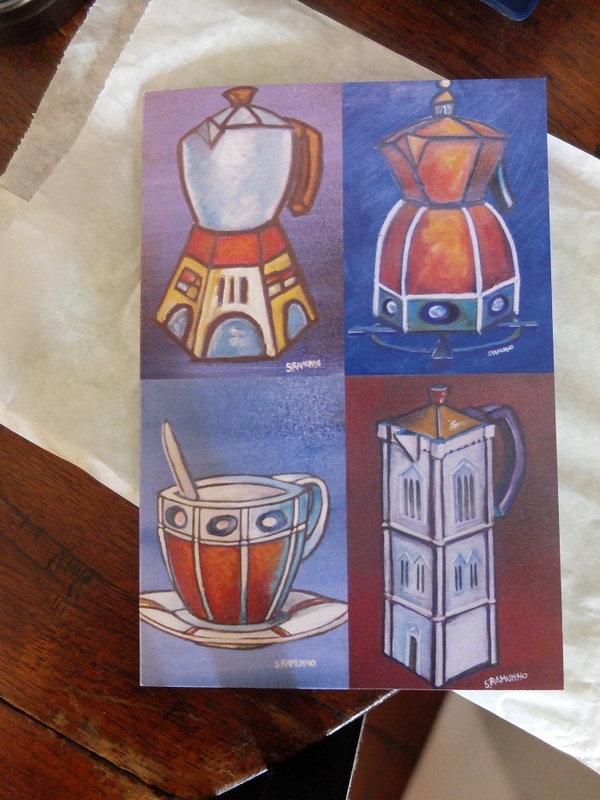 Her cards are simply marvelous, picturing charming Florentine scenes from next door neighbor Stefano Ramunno (see below) and they are made of good quality, highly recommend. Location: via Romana 11/r. A pretty ceramics studio and shop by artisan Anita, this was an awesome suggestion by my friend Lindsay, and I am grateful for the tip. She has truly beautiful items that will compliment your ikea furniture (or antiques), quite well! Facebook page . 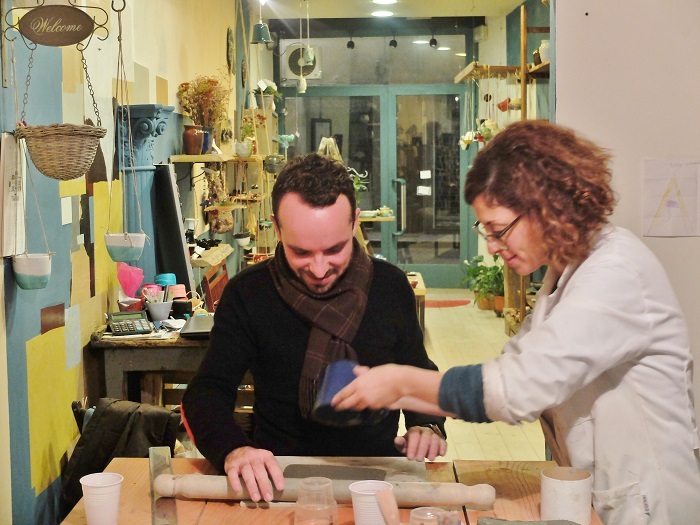 I also recommend inquiring about taking a ceramics course with Anita, we made some mugs and had a lot of fun for a price tag of only 25 euros a session! 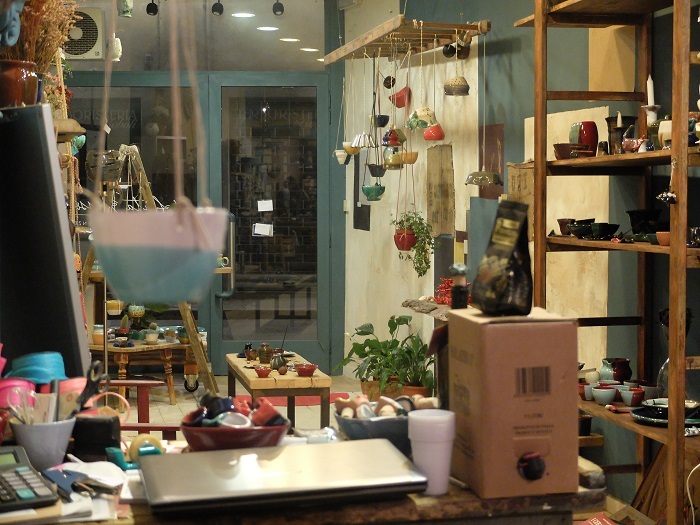 Location: via maggio 47/r: A cool shop owned by renowned calligrapher and packaging designer, the marvelous Betty Soldi. Inside you will find a curious amount of items from huge Neon letters to beautiful cups and saucers featuring Betty’s calligraphy and various Florentine scenes. While it’s definitely not cheap, I do think the items here are very special and make the perfect gifts (especially for yourself). Location: Borgo Tegolaio 33r. Tel. 055 2654675, Email: millesimisrl@tin.it This place is a recent find and my oh my and I am happy to have found it. 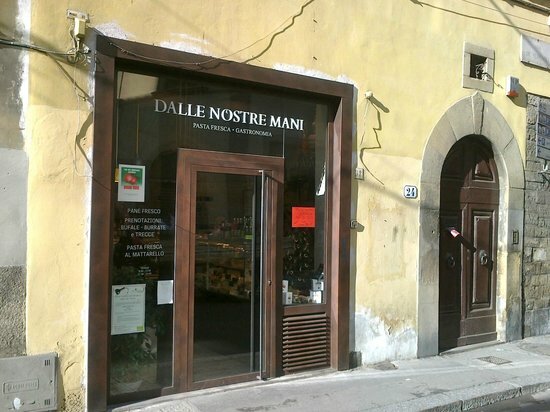 This wine shop is on a hidden street near Piazza Santo Spirito and is owned by a French/Italian couple. Inside you will find a vast amount of wines, many from Piedmont and France, it’s so refreshing to have a variety of wine for times when Chianti Classico isn’t your friend. I tried an amazing French chardonnay recently and I was pleased that it was a decent price. This is also the place you want to come if you are looking for champagne. Make sure to ask Marie, the owner to show you the cantina which is almost twice the size of the store itself. They also have an impressive amount of vintage Barolos for those who are interested and starting to import interesting beers. Location: Via De’ Michelozzi, Florence, Italy. A shop that doesn’t have a name (that I know of ) and looks like it doesn’t get a lot of love but instead has an original newspaper from the 1966 flood in the window. This tiny store many walk past without thinking to stop inside. Sandwiched between Gusta Panino and Gusta Osteria, it might not look like much but if you are looking for an authentic & tasty Tuscan sandwich, I recommend going inside and getting some mortadella on a fresh slice of pane toscano, you won’t regret it. Location: via serragli 57r. This shop sells organic goods with all sorts of gems that can be tough to find in Italy, namely light coconut milk, different types of thai rices, quinoa, ginger drink (like ginger beer), chickpea powder, gluten-free, vegan friendly. It’s a gem for those looking for items not normally carried in the larger supermarkets. 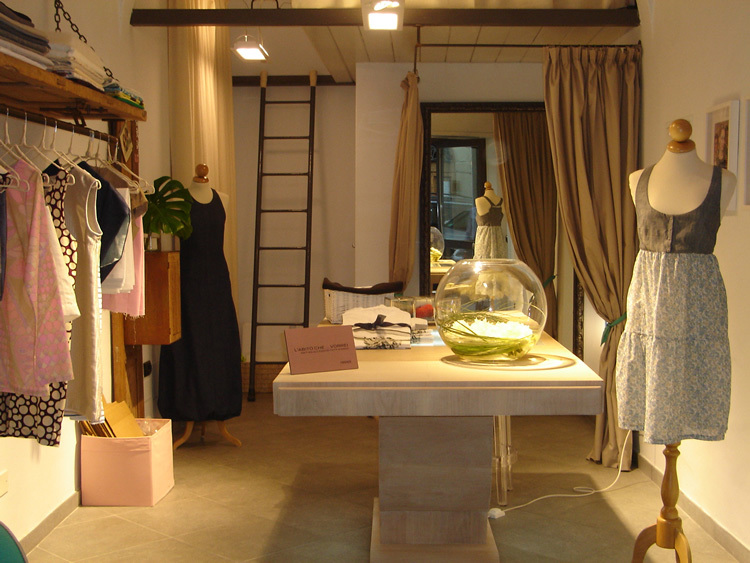 Location: via dei serragli 32r: Another one of those stores that reminds me why living in this area is a damn good idea. 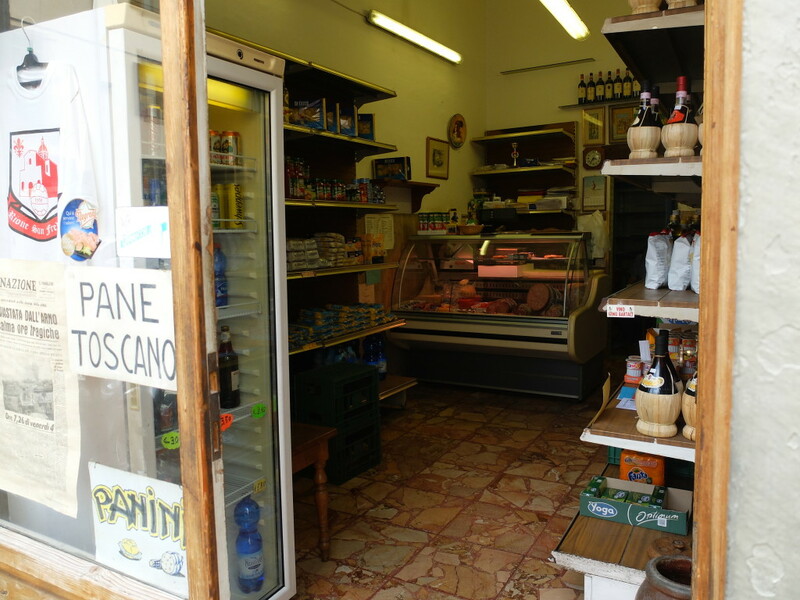 This shop on the corner of via serragli and via santa monaca sells fresh pasta, cheeses, olive oils and advice ;-). The perfect place to pop in and grab fresh ravioli, made that day to accompany a simple sage butter sauce. heaven! Location: via serragli 39r: A tiny little alimentari (Italian food shop) selling cheeses and meats which are anything but ordinary. They also have two types of cheddar cheese from England and some French options as well, plus some really wonderful ricotta. This is my go-to cheddar in central Florence. Location: Via Maggio 61r. 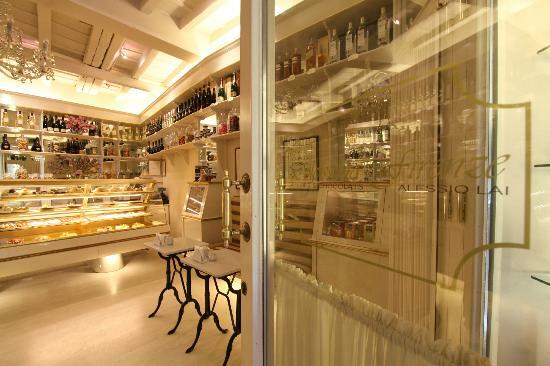 This pasticceria shop is an institution among Italians in this neighborhood. When I was a nanny, the mom would often ask me to stop here to pick up some sweets for a birthday or special event, and thank god she did because that’s how I discovered this place. Their cakes are so good, I actually dream about them. They are open everyday but Monday (closed at 2pm on Sunday). Location: Piazza Pitti 1R. Directly in front of Palazzo Pitti, this place is somewhere I frequent quite a lot, also because the people who work there are beyond friendly. They carry quality teas from La Via del Tè, Dammann among others, along with chocolates and other specialty items. It is worth noting that their prices are very good, I have definitely paid more for less at other tea shops in Florence. They even let you sample teas before you commit, which I think it very cool and something most places would never do. They also have gluten-free & sugar-free options. Website here. Totally my ‘cup of tea’ ;-). That’s all folks, now I am assuming that I missed out on some special spots so I ask to you to please share via commenting what stores you love in the oltrarno area and why! Thank you for the beautiful photos and the amazing information!!! Looking forward to your next post!! Cheddar! Everyone back home in the US laughs at me when I admit that one of the things that I miss most is Cheddar. I may have to make a trip to Florence just for the Cheddar. Now, the real question, how does it melt? I adore Italian (and even more French) cheeses but cheddar, well cheddar just tastes like home doesn’t it? And though we have some nice options in the states, the English really excel at it, I highly recommend picking some up when you’re in town. I melt my cheddar a lot for cheese sauces and nachos etc and it works great, just remember if you are making a sauce, you want to heat up the milk and flour, stir with a whisk and add the cheese only after the milk etc. had been taken off the burner or it may curdle :). Buon appetite! Hello Sharol, it is my pleasure! I really enjoy writing about my neighborhood and these shops really deserve to be written about, they are special to me! Thanks, Georgette for these wonderful suggestions in the Oltrarno! We love Via Romana and have stayed many times on this street at our favorite hotel, Annalena. Vicki and I are here permanently now, we arrived last Monday at our apartment on Via del Proconsolo. Even though we live in the centro on the “other side” of the river, we love the Oltrarno! We’ve already found many restaurants and shops there that we like and look forward to following your shopping suggestions. We might even run into you, we’d love to introduce our little Chihuahua, Pachito, to Ginger! You guys are here! How exciting is that? I saw the view from your window on Facebook and just WOW. I like via proconsolo a lot and I think it’s wise to be that central your first time living here. I would love our pups to meet, pachito is a great name! Well, it’s been an amazing first week in Florence for us. Today, we visited some of your great suggestions in the Oltrarno and found some wonderful things for our new apartment. Tonight, we were walking the dog and stumbled on a fantastic concert in the Piazza della Signoria. Questa è una migliore città! Bob, I am so happy to hear that you guys have settled in well. Happy to know that this post helped you outfit your (amazing) new place! Enjoy every moment! 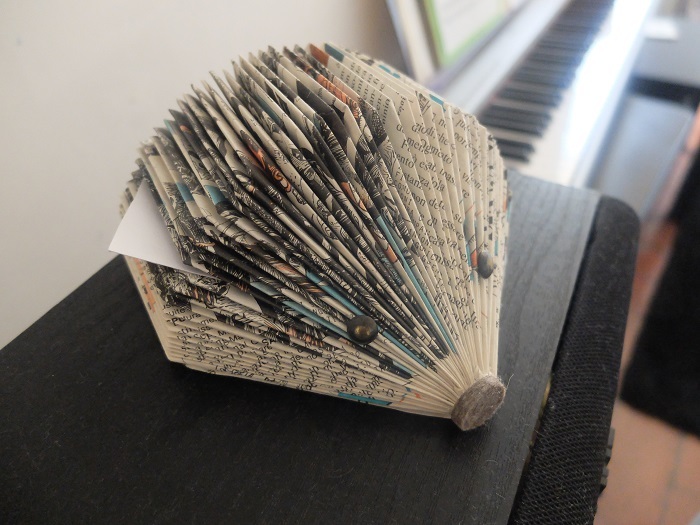 Georgette…what a joy to read your blog!! 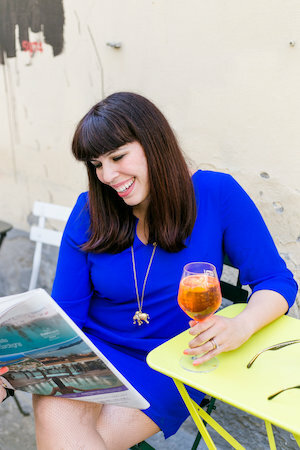 I am a Cal-Italia girl living in Lucca for the past 6 years. My husband sent me your site yesterday…new information, giggles, and a feeling of excitement knowing that there are some new areas to explore….great work!!! I’m so glad I stumbled upon your website, since I just yesterday booked an apartment on Via dello Sprone in Oltrarno for 9 nights in July!! Can’t wait! Thanks for all of your insider tips! Ciao! We are going to be neighbors! I live on that same street and you will love this area, it’s fantastic 🙂 I am happy to help! Hello Patricia! How nice that you booked an apartment there, I adore via maggio and you will undoubtedly find it a lovely place. I am so happy that my suggestions have been good, that makes me really happy and motivates me to keep it up. Your comment made my day, thank you! Hi! I love your site it has been very helpful in planning a afternoon in Florence when I visit in August! I would really love to find a beautiful 100% Italian Scarf in Florence, any suggestions? Hi. Thank you for the interesting article about one of the best cities in the world. 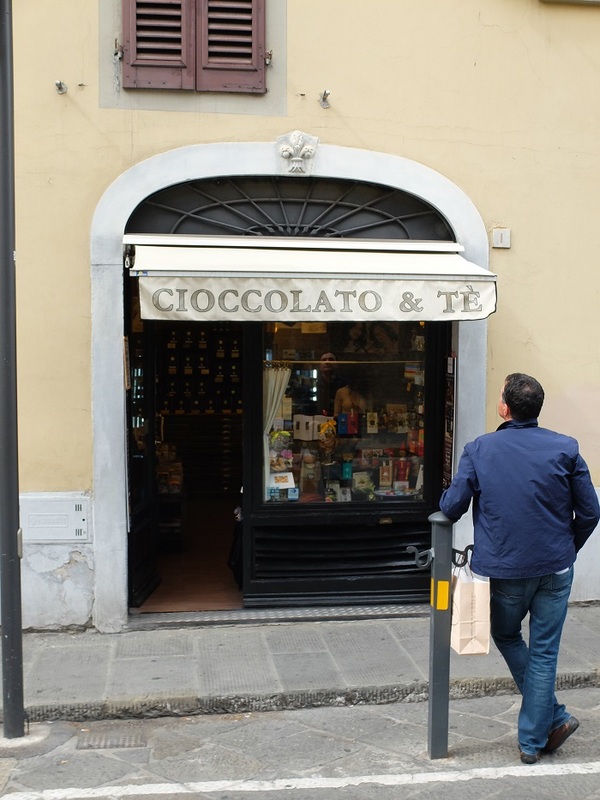 Do not you know there any good sweets market closely to Pitti Palace or between it and Ponte Vecchio? Yes I do! Check out Dolcissima on via maggio 61r, it’s the best! I am continually finding new and exciting information on your old postings. I’m two months into my stay here in Florence with sadly only 2.5 more months to go. 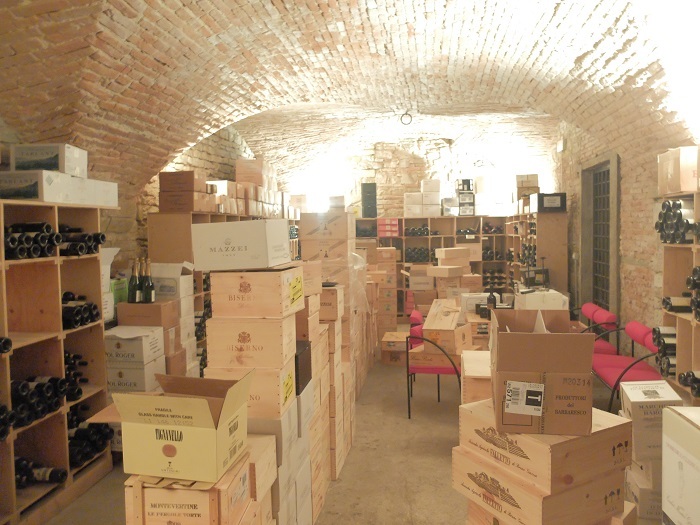 Today I searched out Enoteca Millesimi and oh boy did I find some amazing wines and champagnes!!!!!!! Since I walked there and back to my apartment I only purchased 4 bottles since I was obviously carrying them but this is definitely my new wine shop! Between you and Coral @ Curious Appetite I feel like I am getting the best of the best recommendations here in Florence! Thank you Amy, I really appreciate you checking out our blogs. 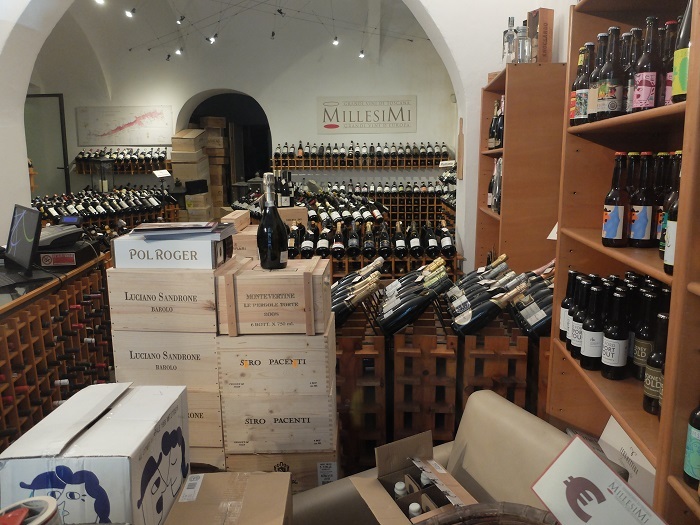 Enoteca Millesimi is my hidden find. The perfect place to pick something up for a nice night out with friends, happy you got to visit!